The Raspberry Pi has sparked a new interest in micro-computers and electronics, spawning a large number of very similar new products, which, at a quick glance, could easily be mistaken for the Raspberry Pi itself. The HummingBoard certainly fits into this category. 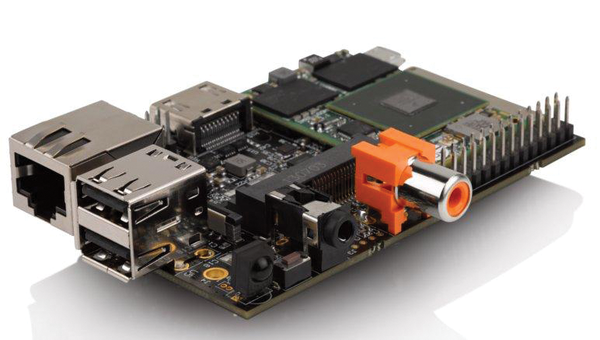 HummingBoard is manufactured by SolidRun, a highly regarded company in the microcomputer world known for the CuBox-i, which is often used as a highly capable media center platform. Issue 6 of Raspberry Pi Geek looked at another board called the Banana Pi, which is a fairly obvious clone of the Raspberry Pi. Like the Banana Pi, the HummingBoard looks very much like the Raspberry Pi; however, it also brings with it an interesting array of innovative ideas, as well as what appears to be a fully customized software stack that will happily run across any of the SolidRun products. The design is modular, featuring the HummingBoard carrier and then one of the modules from SolidRun's MicroSOM collection (micro-system on a module), with the option to have WiFi and Bluetooth on board as well. Should you need extra RAM or a more powerful processor in the future, you can upgrade the MicroSOM without upgrading the carrier. All of these options lead to the choice between a huge and somewhat perplexing 16 different variations! The prices range from US$ 44.99 for the base model right up to US$ 146 for the full-featured, quad-core version. The HummingBoard addresses a number of the concerns raised over the Banana Pi. The makers admit that the layout is designed to be identical to the Raspberry and, unlike the Banana Pi, the HummingBoard has been confirmed to work with a number of Raspberry Pi cases with little to no modification. The compatibility with the Raspberry Pi GPIO layout is unconfirmed at this point, although I might have an update on that in a later issue. I have several sample SolidRun boards on order and will take a closer look at this product in a future issue. In the meantime, you can find more information at the SolidRun website . Ocean Optics has introduced a new set of spectral sensing tools for developers and others who want to deploy spectroscopy in new applications. The STS Developers Kit makes it possible to create a platform for easy, affordable, research-quality spectral measurements. 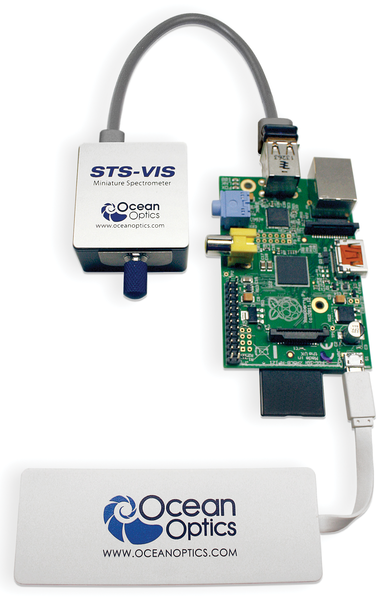 The kit brings together Ocean Optics' powerful STS spectrometer, a Raspberry Pi (of course! ), customizable software, and wireless capabilities in a single package. You can quickly configure the kit right out of the box for a variety of measurements. You can use the kit to develop handheld devices for applications such as color determination in liquid, gases, and solids, color temperature of LEDs, or solar UV data collection. 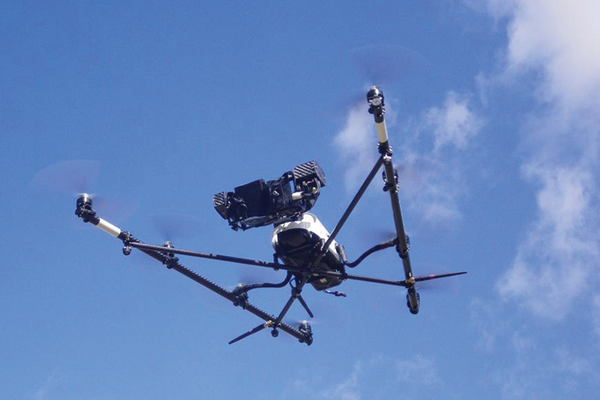 You can also create cloud-connected measurement clusters, and even mount the sensors on UAVs for remote monitoring (see the picture). The STS Developer Kit takes advantage of the Raspberry Pi's flexibility and adaptability to enable new uses for spectroscopy. Once connected to a WiFi network, the spectrometer can be controlled through phone, tablet, or web browser. The WiFi range is up to 150m, and all data is securely stored on the Raspberry Pi SD card. The kit comes preloaded with this simple interface and is ready to use out of the box, but the development platform makes it fast and easy to customize for special projects. The web scripting API enables quick development of custom scripts and applications, allowing the STS and Raspberry Pi to perform even more complex tasks. Ocean Optics SeaBreeze drivers communicate directly with the spectrometer via the USB interface. A daemon service enables more autonomous functionality, as well as coordination with other hardware, such as switches or even sampling accessories. The core of the kit is Ocean Optics' STS micro-spectrometer – which, at less than 42 mm square and 24 mm high, delivers fantastic power in a very small footprint. The optical design and advanced CMOS detector elevate the STS to performance levels comparable to larger and more expensive spectrometers. Excellent linearity, high dynamic range, and wavelength accuracy ensure reproducible and repeatable results. In addition, high thermal stability performance and low baseline drift ensure that data stays accurate, even under changing environmental conditions. The STS Developer Kit offers the choice of three STS models: STS-UV (190-650 nm), STS-Vis (350-800 nm), and STS-NIR (650-1100 nm). We've only been provided with ballpark figures for these devices, but the models are available for approximately UK£ 1,000 (US$ 1,500). Pricing is the same for all variants. You can request tailored pricing and find more information at the Ocean Optics website .